HELLO!? HELLO!? Is anyone still here? Sorry for that extended, unannounced absence, the day job really got the best of me! In order to make up for lost time, I will be shotgunning entries with like or no introductions, accouterments or order. So be sure to check in often. Thanks for visiting. 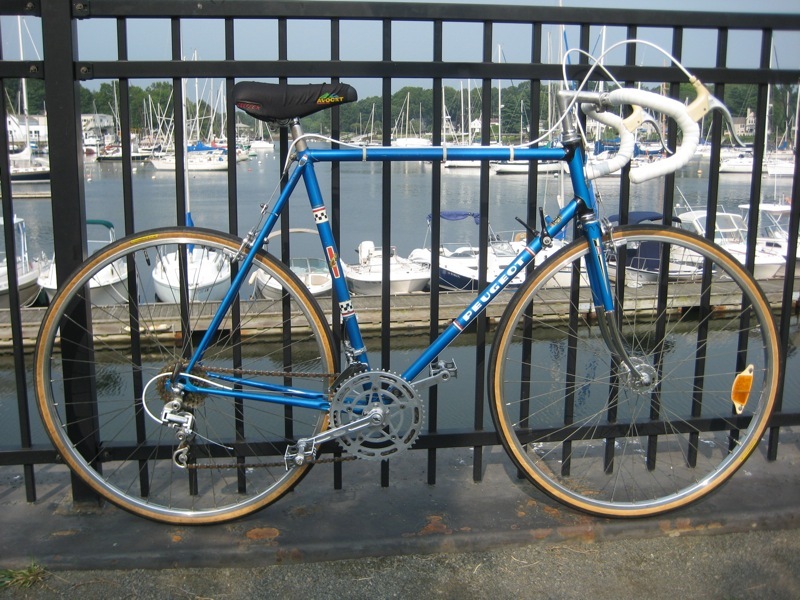 This is Rob T’s first contribution to the OTSG, a cherry 1975 Peugeot PR-10. This is my first submission to OTSG. 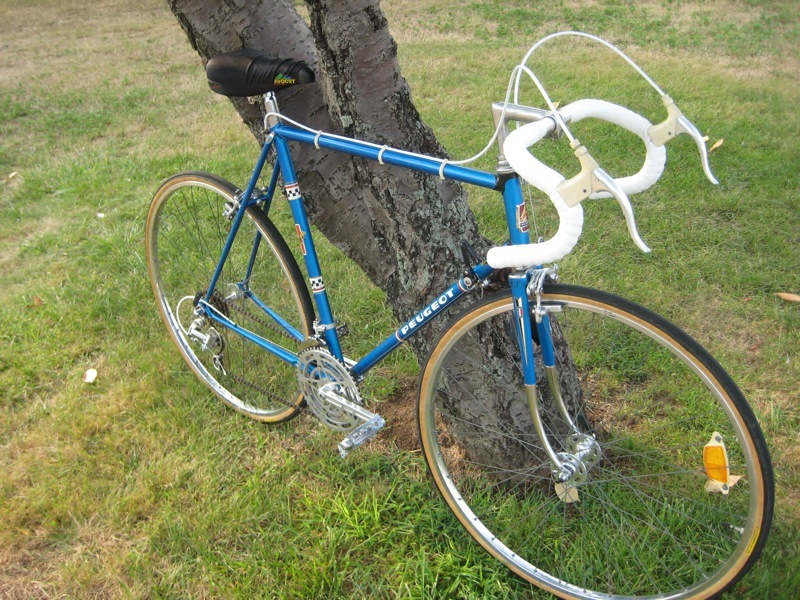 This 1975 Peugeot PR-10 was my bike when I was a kid. I toured thousands of miles on this bike. It has been sitting in my garage in pieces for almost twenty years. I finally got around to overhauling it. 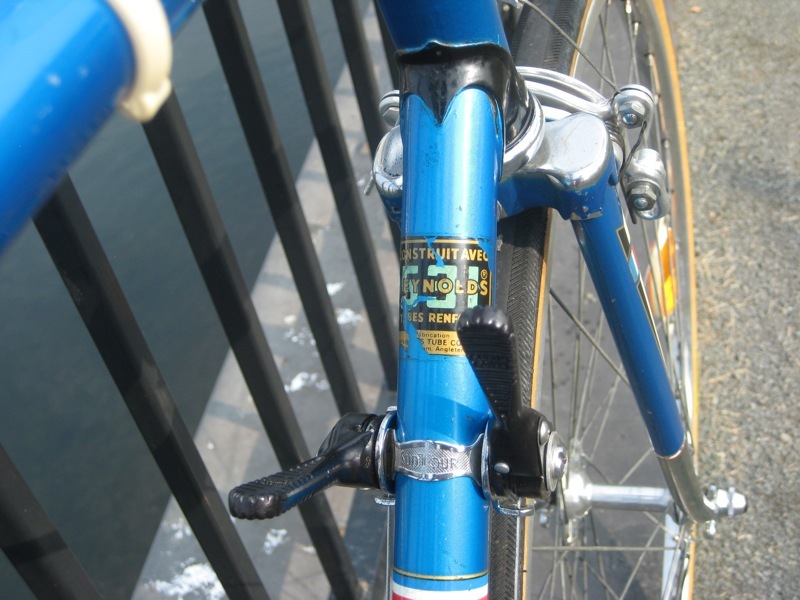 The PR-10 was Peugeot’s bike just below the celebrated PX-10. It has Reynolds 531 in the three main tubes (but not the forks and stays), Stronglight 49D alloy crank, alloy wheels, Normandy hubs, Mafac Racer brakes, Ava stem and handlebars. 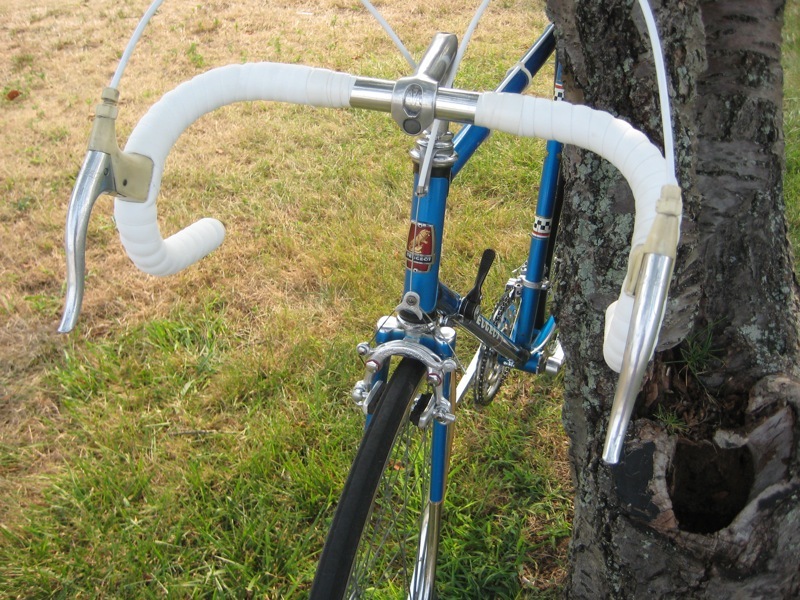 It has all original parts except the seat, tires, derailleurs, and freewheel. I swapped the original Simplex rear derailleur for a SunTour V-GT Luxe a long time ago, presumably to accommodate a larger cluster. 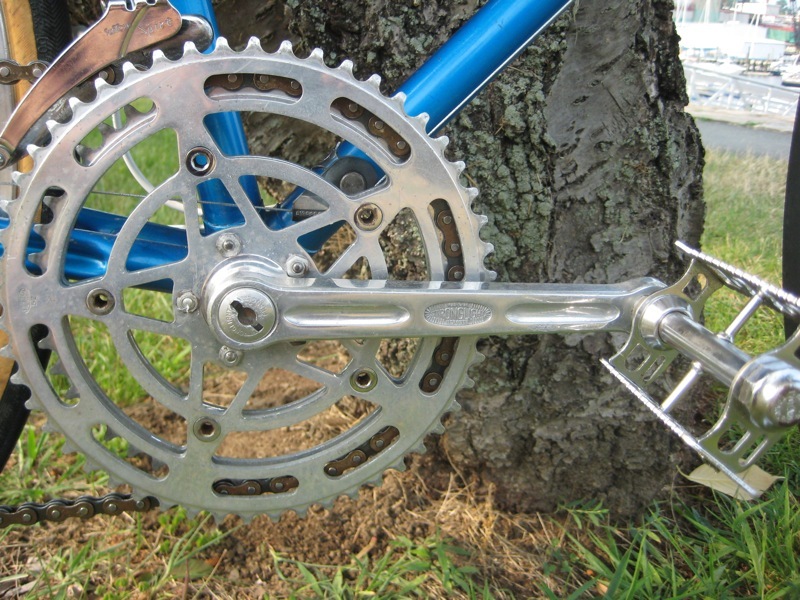 The Simplex front derailleur was broken so I replaced it with a vintage SunTour. The ride is still terrific, although the brakes squeal something awful. They always did. Back in the day we used to grab them with a wrench and twist like heck to toe them in, but I would be afraid to do that today. Michael P’s 1975 Viscount Aerospace G.P. An enviable bicycle, Rob, and you can be proud of those miles and your loyalty to your old ride. You don’t mention if you have a carbon something in the garage today and this is a labor of love or if you are re-entering the World As It Should Be: Two Wheeled and Steel. Cameron! I was afraid you had gone in search of Yehuda Moon! Couldn’t stand to lose both of you in the same season. I was keeping a stiff upper lip and all but then Snob linked you today and I hit the button and Voila! You’re Back! Praise Lob! I’m your brother, Wayne. Remember the junk cheap white Peugot we bought at the Sheriff’s auction, which we made barely ok enough to ride, and I then rode? This is the bike you rode in Wales, right? When did you buy it? I bought at least one of my bikes with you along for company (the Peugeot I got run over with, or maybe it was the Falcon. Were you with me when I bought the first purple Gitane?). I don’t remember when you got this one. Reynolds 531! Double butted? I’m jealous. What cool, cool memories you’ve brought back! I’m really jazzed that you got it finished! Thanks for turning me on to this website! Very nice Peugeot- love the story brought back from the dreaded “hanging in the Garage” and overhauled back to sweetness by the original owner. And Cameron glad to have you back gotta say I was starting to get sick of looking at brown Raleigh sports 😉 what can I say I am now addicted to OTSG.